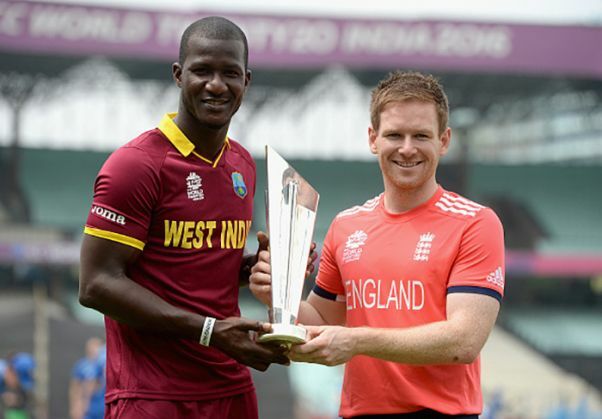 Home » T20 World Cup » West Indies' hammers versus England's scalpels: who will win the WT20 Final? The dancing cavaliers from West Indies are endearing. But are they built to beat England at Eden? Which of the teams starts as the favourite? It's amazing how the blaze of star quality and showbiz fails to cover up chinks in the armour. Never did anyone consider, with any particular seriousness, that India had one real batsman, and that no one else was really doing anything. Also, no one was paying any attention when the bowlers were overstepping at the nets. It was always about India winning, and whom they would play in the final at Eden Gardens on 3 April. Then the blaze of glory faded, and the cracks were there for all to see. Now, we have the West Indies. "We are the champions maan!" seems to be the next new thing in town, as Dwayne Bravo gets a lot of free mileage for his music. It was quite an entry they made into the hotel after beating India. It looked like a full Indian wedding baraat, with a full rank of dancing guests led by old Bravo and skipper Darren Sammy. They sure know how to make an entry. So, all the hype surrounds the Caribbean boys now. But as we have seen, hype doesn't necessarily win titles. Neither of the finalists, West Indies or England, were favourites to reach the final, so one can understand why the Windies are so happy. Added to that now is the bravado of "we can hit the ball". The question being raised by the West Indians is, 'how are you going to prevent us from hitting boundaries'? Simple - by providing you with a larger ground and a pitch that will turn. What no one is addressing is that Eden Gardens is not a ground where you can cart the ball around with abandon. Every team has faced this, including the West Indies themselves. So if your mantra is to outhit the rivals, now would be a good time to take another look at it. If you can stop dancing, of course. Not so long ago, yours truly was in a television studio with Shoaib Akhtar. The fiery Pakistani had made two telling points: one, we (the sub-continent people) play with our hearts, while teams like England and Australia play more with technique. Two, he didn't think any of the Asian teams would make it past the Super 10 round. He was 75% right on that. The question being raised by WI is, 'how are you going to prevent us from hitting boundaries'? Anyhow, back to Eden. If there will be any one side in the final which plays from the heart, it will be the West Indies. Cricket at Eden needs to be played golf at the Delhi Golf Club - you can hack all you want, but all you'll get is dust in your eyes and the ball stuck deep in the jungles (or in fielders' hands). You need to be a surgeon with a scalpel at Eden, not a blacksmith with a hammer. That is where, I feel, England have the edge. The English can be suitably obnoxious, but quietly so. They don't have the dancers or the samba-reggae mix. They do have an occasional Andrew Flintoff, but his battle was more with Amitabh Bachchan and the rest of India than his run-binging Caribbean friends. The root cause of that feud, predictably, was Joe Root. Like it or not, Root may well be the surgeon whose scalpel could do the surgery on the Caribbean hype. Eden is a track that encourages bowlers, especially those who turn the ball, swing it or can take the pace off. The best bowler of this lot could be West Indies' Samuel Badree. He has the ability to confuse batsmen even on placid tracks, so a lively one would really be up his alley. Badree is by far the best spinner in the final, so it would be interesting to see how the Englishmen approach him. This is where Root comes in - he has the technique, patience, and above all, form, to tackle Badree and, to an extent, Suleiman Benn. That said, Adil Rashid and Moeen Ali could be made to look better than they are, simply because the West Indians do not possess a genuine grafter, the one batsman who would deal with these two by keeping the ball on the ground and seeking gaps. The likes of Jason Roy, Jos Buttler or Alex Hales won't find it any easier than Chris Gayle or Johnson Charles, or the rediscovered Lendl Simmons. Eden has it in itself to keep everyone interested, more so the bowlers. At the same time, dew can come in and add to the drama of a packed 75,000-strong crowd. There has been a cloud cover over Kolkata over the past few days. Add to that the pall of gloom cast by the flyover collapse, and a cricket match seems such a small thing to worry about, compared to the human tragedy. But that is how life and cricket are. They will go on. I won't be rooting for Root, since the English, commentators and tweeters alike, will be insufferable if they win. But they have the technique for Eden. And the footwork that matters. TWEET THIS With India out, whom should you support in the World T20 final? WI or England? Here's the answer The dancing cavaliers from West Indies are endearing. But are they built to beat England at Eden?